Salsa made with canned tomatoes? Yes! 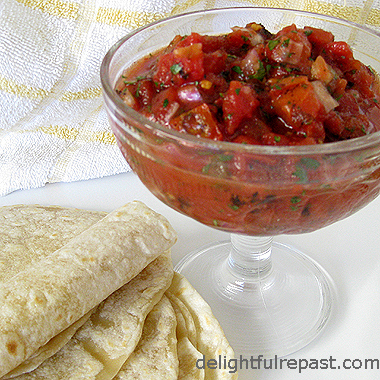 For a taste of summer any time of year, whip up a batch of salsa made with canned tomatoes. I know, I know--I'm all about fresh; but tomato season is not quite here, and I refuse to buy out-of-season imports or any of the pallid objects that pass for tomatoes in most supermarkets. I've found that really good canned tomatoes (I always use Muir Glen organic) make better salsa than the less-than-stellar fresh tomatoes available. Granted, it's not the salsa fresca we can enjoy during tomato season, but it's much fresher tasting than any of the store-bought salsas I've tried. In fact ... This is how fresh tasting it is. We had guests for dinner--guests who are really into food and into salsa--and they were crazy about it! AND (yes, I'm shouting) they did not know the tomatoes were canned! And I didn't tell them, thought I'd save that little gem for another time. There was just a tiny bit left over, and when I tasted it two days later, I was blown away! How can something taste so fresh after nearly 48 hours in the fridge?! Since it was early in the morning when I did my two-day taste test, I just went ahead and made organic tortilla chips and salsa, with a side of leftover Mexican rice, my breakfast. It was that tasty! But I wouldn't try this with just any canned tomatoes. At the risk of sounding like a shill for Muir Glen, I would only make this with Muir Glen tomatoes. Truly, I am not on their payroll; they simply make the best canned tomatoes. In 3-cup bowl, combine all ingredients; stir together. Cover and refrigerate for 6 to 24 hours before serving. Garnish with more cilantro. Two winners will each receive a Muir Glen Organic Reserve Gift Basket. All US residents who leave a comment (one entry per person) on this post before 11:59pm Eastern time Wednesday May 16 will be put into a random drawing. Winners will be announced here before noon Eastern time on Thursday May 17. Other recipes you might enjoy: Mexican Rice and Homemade Flour Tortillas. You're salsa looks fab. I'll have to try it. Melissa, thanks! I hope you'll try it soon. Tammy, just look for a good brand of organic canned tomatoes. Hope you like the tortillas. And come back for my homemade corn tortillas. I'll be posting about those soon. Jean, I can get all these ingredients at my local TESCOS tomorrow. We've actually got some of the ingredients already in the kitchen. Apart from cilantro. What is that? We call it coriander. All is clear now!!!!!!! That's great, Tony. Of course, if someone could not find the tomatoes with medium green chiles they could get a small can of green chiles to go with their can of plain diced tomatoes. This salsa looks yummy! I read that Muir Glen is one of a very few brands of tomatoes whose cans are BPA-free. Thanks, Amy. Glad you're concerned about BPA too. This eating is tricky business! looks delish, I wanna try the tortillas too. Thanks! evanoff, I wish you had too! Those yucky tomatoes are often quite expensive. loulou, thanks! I hope the salsa and tortillas turn out well for you. Watch for my corn tortilla post coming up. That looks so good! I will try it this weekend :) Thanks! Tracy, thank you! Hope you like it as much as we did. Hi Jean, lovely rich looking salsa - I've never heard of Muir Glen... I guess it's US only. Oh well :( No chance of winning yummy tomatoes for me! I hadn't considered making salsa with canned tomatoes, but it's a wonderful idea, especially when tomatoes aren't in season! Ah, salsa. Ketchup with a sombrero. Now we're back into food with an attitude. I do love my sauces. And yours. If there was only something to put it on… The only thing I do with chips is make them into duck lips in order to make small children laugh. And even though I do eat tacos and tortillas, the wraps are basically bread with a Spanish accent, and I'm apt to leave the squished up empty end of the wrap on the plate. So what else do you put salsa on? Muir Glen? Glad to see you Londoners have made peace with the northern hinterlands. Thanks, Charles! Yes, I suppose Muir Glen is US only. 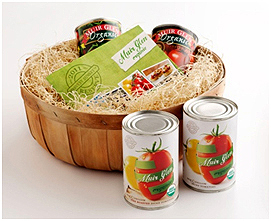 Do you have a brand of good organic canned tomatoes in BPA-free tins in France or England? Steel Springs, thanks. Yes, whenever a fresh off the vine, local organic tomato cannot be had, I don't even bother with fresh. The out-of-season supermarket styrofoam article just won't do! Sully, I put salsa on all sorts of things. For example, when cooking for a group that includes people who don't like spicy hot, I'll leave the heat out of the enchiladas (or whatever), and then those who like spicy hot can put some of this salsa on them. Also, you can put it on rice or macaroni and cheese or any number of innumerable things. Yum, I love Muir Glen tomatoes! I have been meaning to make your Mexican rice. And I have never made salsa from canned tomatoes, but it would definitely be a cheaper and "quicker" alternative to fresh tomatoes. Yes, Lauren, it does speed things up a bit. And who of us doesn't need that from time to time! I make not-too-spicy and not-too-wet (the common mistakes people make) Mexican rice, and those at the table who like theirs hotter and wetter can just top it with a little of this salsa! Homemade salsa is always the best. I love cilantro and always add it to premade salsa. Lindsay, I think cilantro just "makes" salsa, but I've heard that a LOT of people hate cilantro. How could anyone hate cilantro? What's not to love? Thanks for stopping by my blog, and I am pleased to find yours as well. I just perused a couple of your posts and was immediately drawn to the post about the Biltmore tea. Terri, thank you! I have other afternoon tea reviews and lots of posts about tea and teatime treats on my blog. I hope you'll enjoy them. Tanna, thanks for stopping by. I definitely plan to stop by The Brickstreet Bungalow when next doing blog visits. Leann, this one is pretty *hot* but you can skip the crushed red pepper flakes and just go with the heat of the medium green chiles in the Muir Glen. I love using muir glen's products in a pinch. Yeah! Oh, do try some of my gluten-free recipes, won't you? THis looks so fabulous I can't wait to try it. Thanks, Svetlana! I hope you like it as much as we do. great prize pack, hope i win! *Muir Glen Organic Giveaway Winners Announced* - The two winners of the Muir Glen Organic Reserve Gift Baskets are Terri ~the dressed up cottage and Ashlei. As soon as you send me, delightfulrepast at aol dot com, your addresses and phone numbers (required by FedEx), Terry and Ashlei, Muir Glen will FedEx the packages to you. Come back tomorrow for a delicious braised brisket recipe AND the chance to win an organic, grass-fed brisket! Thanks for visiting me, just came over to visit you, saw this post. I want to make the salsa. Where can I purchase the Muir Glen tomatoes???? I am longing for some salsa . . . wish I had noticed your giveaway before the 16th! Thanks, Lynne! Let me know how it turns out for you. You can check Muir Glen's store locator page, http://consumercontacts.generalmills.com/CrunchProdAvailability/ProductAvailability.aspx?m=24 , or order online. Jean, thanks for linking in. I've sorted out the links for you. No probs. Hope you are having a good week. Thanks, Carole. Glad you reminded me of this salsa. I'm going to make some right away!